Verizon announces BlackBerry Flip 8230 | BlackBerry Blast! Verizon Wireless and Research In Motion announced today the BlackBerry® Pearl™ Flip 8230 smartphone will be available on the nation’s largest 3G broadband network beginning June 19. 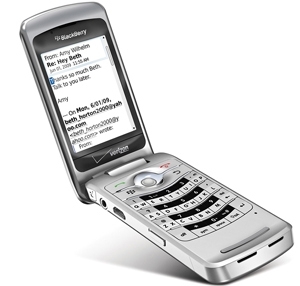 The BlackBerry Pearl Flip 8230 features the industry’s leading mobile e-mail and messaging solution combined with rich multimedia capabilities and the high-speed connectivity of Verizon Wireless’ broadband network in a popular flip design. The Verizon Flip will be available in silver.